One recent morning, as I was driving out of my neighborhood, I noticed a spider web that caught the sun as its rays were starting to rise above the treetops. It caught my attention because of the beautiful pattern and how subtly it blended into the surroundings. I made a mental note of the time and decided that, if the next morning were clear, I would walk by and see if I could capture the image in the same sunlight. Next morning, camera in hand, I noticed that the web had moved slightly… and there was no sign of that spider. Yesterday he had been sitting right there in the middle of the web, waiting on his first visitors. Today, missing in action. First, the spider sets up his web where he can take the best advantage of his primary focus: the food supply. 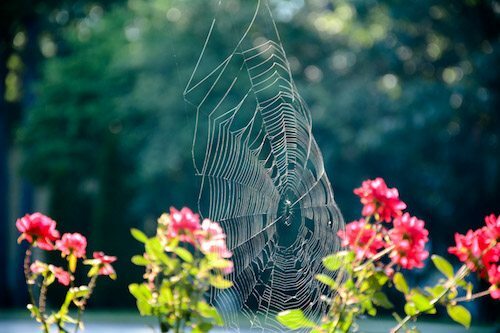 In this location, the spider knows that fresh flowers will attract a variety of other insects. And, because these insects are busy feeding, their attention will be on their own supply of food, not on subtly-located spider webs. Photographers often leave it to chance—hoping that the perfect shot will just show up. This may work out… and, as someone who loves street photography, often this chance encounter can produce memorable images. Want to know how to take great photos? Really great images come from come from planning a shoot, deliberately picking the location, and ensuring that all issues are addressed before taking the shot. Thus, the photographer can capture that great shot when the moment arrives! Second, the spider was quick to abandon his web once the conditions changed. A heavy rainfall shook the tree so much that this well-constructed web had been rendered unusable. Our spider friend had moved on to the next opportune location. Conditions are rarely perfect for photography. But this should never lead to disappointment. Instead, a great photographer will always be looking for the next opportunity—knowing that it might be right behind them. Always keep your eyes open and your mind thinking about the next great image. More than once, I’ve planned to shoot a particular scene only to end up with uncooperative weather. On the upside, a stormy day leads to a completely different canvas for us to capture. Third, the spider patiently waits for the perfect condition—that moment when an insect gets tangled in its web. Only then does he jump into action to secure this fresh food supply. Do you ever look at an image and think, “That’s a nice picture… but, if she had just waited 10 more minutes, the light would have been softer, the shadow would be gone, and the whole image would be storybook perfect”? Those 10 minutes can make the difference between a good photograph and a great photograph. Learn to have the patience of nature’s best hunters.